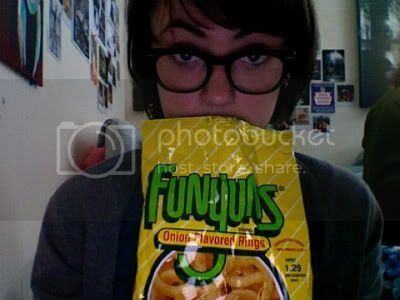 I find myself in need of a nosh, but there's too much to do for me to venture out into the snowstorm looking for Funyuns. Lines to memorize, poems to practice, homework for the class I'm having tonight in spite of everything. And then there's always the instant watch movies on Netflix to distract me. I have watched Gonzo and an episode of Weeds already this afternoon, and I feel no urge to cut it out.